Bonjour lecteurs! To start the weekend en beauté, we are sharing with you our weekly dose of fashion. Plus because it is super hot and we want to treat you, there is a giveaway for you to win a £50 voucher to spend with the summery brand we are about to present you! Baba Fashionista with Kite is colourful and light. Parfait for the Summer! Without further ado, let’s do it! Brought to life just yards from the sea in Dorset the label’s garments are fit for the coastline, countryside and everything in between so that our little ones stay comfy at all times while looking super sweet! The whole collections have a unique look that is inspired by nature. 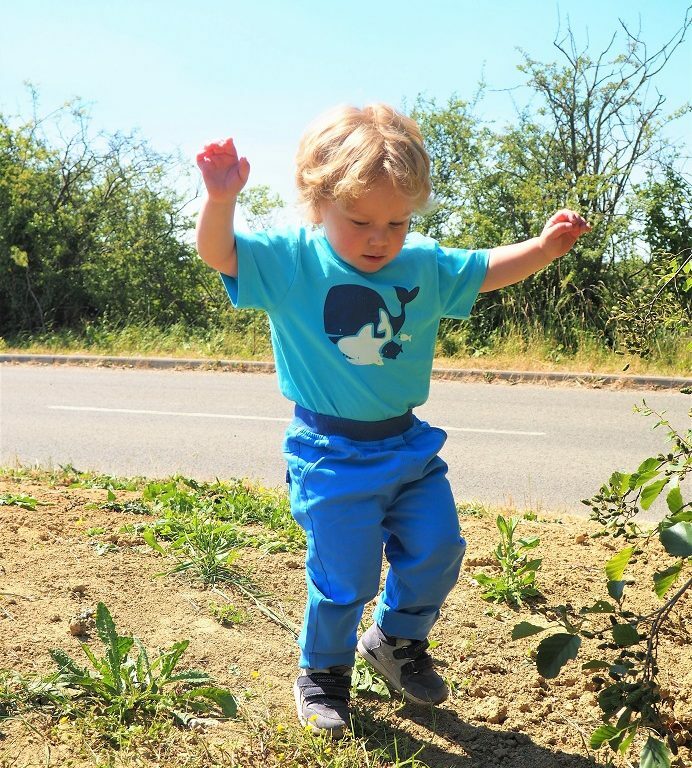 And because our children’s future is mega important to Kite, all of its garments are manufactured using certified organic cotton or fleece made with at least 50% recycled plastic bottles, and the label is also certified by the Soil Association to GOTS (Global Organic Textile Standard). So this brand has some cool principles and we like the name! Let’s see what Baba thought of the clothes. We received a very pretty total look with ma couleur préférée: bleu! 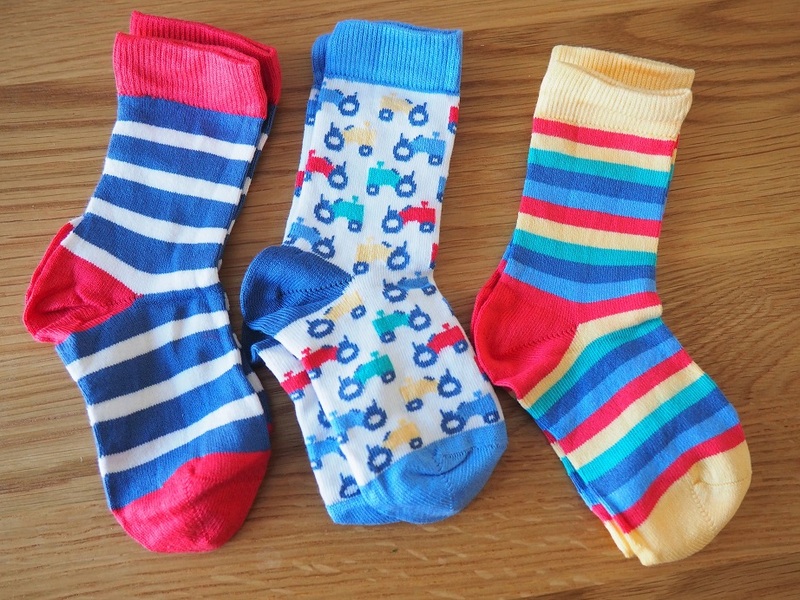 Let’s start with those super cute socks! Baba is totally obsédé with cars and tractors. He is the typical boy really, so those are coming just in time to make him look super duper sweet! Plus the pack also contains some stripes so it could not have made me happier! It’s a staple, it’s a winner. Hurrah! When they arrived, they were all packed in a lovely box with the label’s name. That is so sweet! And the style of those chaussettes matches up with the whole shop’s collection. What do I like the most about them? They are super soft! That’s because they are made in organic cotton. As I previously explained, Kite is very eco-friendly and this top is totally proving it! 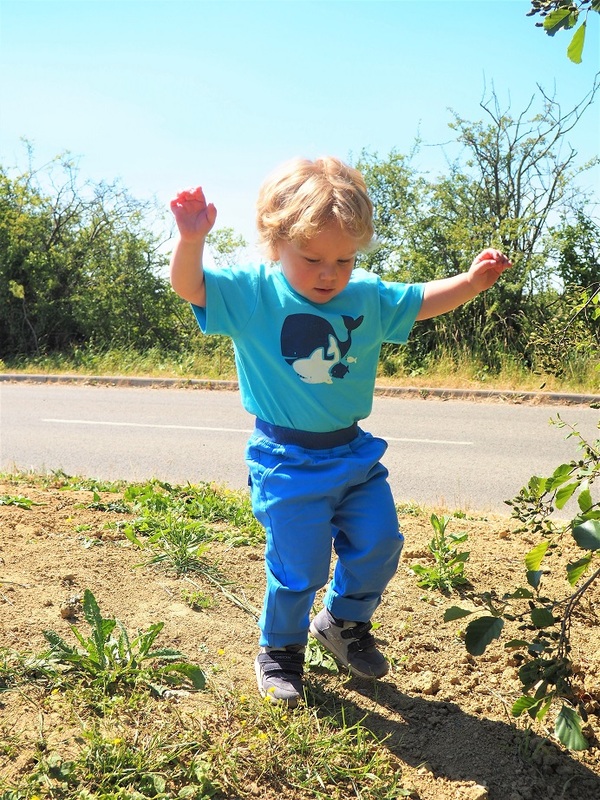 Created to celebrate the harmony of the ocean, this sea buddy appliqué t-shirt is super fresh! 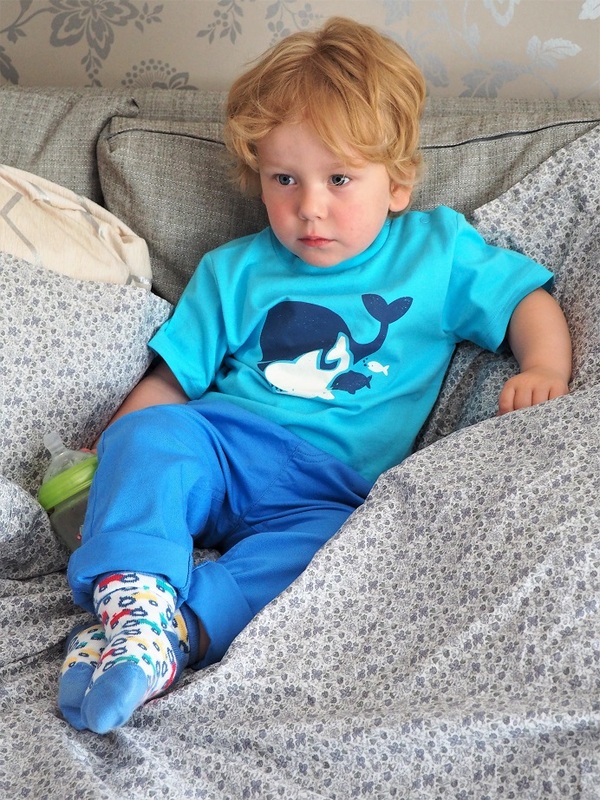 We love the bright couleur as well as our sweet friend la baleine (whale in Frenchie). Because it is also made of organic cotton, this top is super soft. Totally comfy to run, jump and more! It’s bright, fun and it feels so youthful. It is a great garment for the Summer because of its fab colour (I adore it when Baba wears blue and this one is so vibrant!). 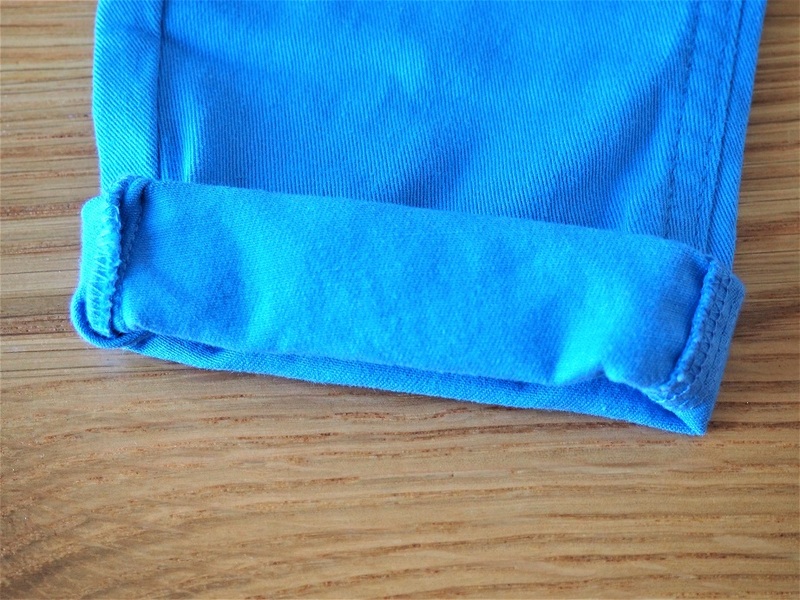 Plus this t-shirt has such an easy fit with the popper shoulder opening. There is no fuss and we like it this way! After our photoshoot in the country, Baba was knackered and all he wanted was to watch TV! C’est simple and super fun to wear it when we go on adventures in the country. To complete this sweet top, we also received some cool trousers. I am usually not a big fan of jeans for Baba. It is always so tight and I fear that he might not be totally comfy. Plus, I admit if it is too stretchy, it is more difficile to put on and off. We are in full swing of toilet training at the minute, so I want the whole process to be as simple as possible. Baba is always happy when he is on his scooter. The last thing on earth I want is to have to spend 10 minutes to try to dress him up! But we don’t have such an issue with those super cute Kite Jeans. They feel so flexible. I also love the soft knitted waistband. It is sweet little detail and it actually comes in handy when you are dressing up a very fidgety toddler! Washed in natural enzymes that come from apples, it has such a soft hand feel. 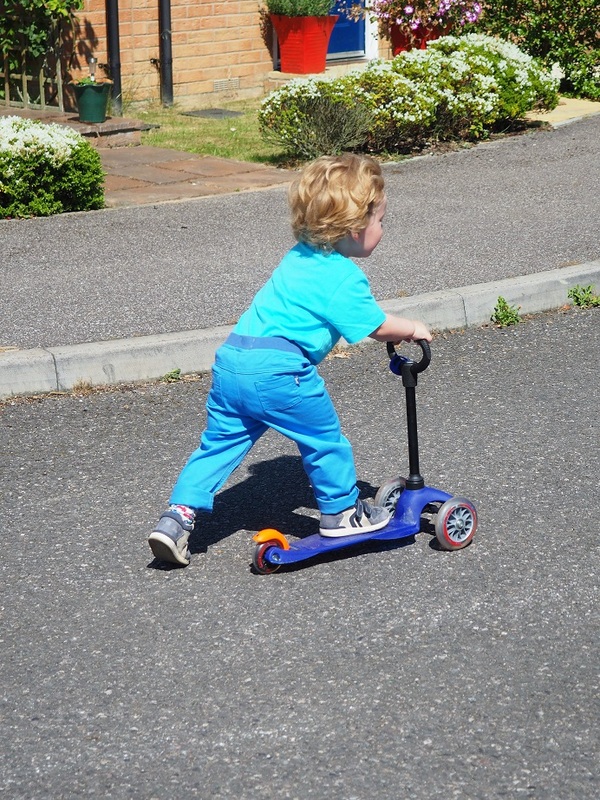 His outfit even matches up with his Micro Scooter!! It is still a bit big for Baba but we rolled up the trousers and we were ready to party! When it comes to quality, there are no compromises for Kite! The whole ensemble we received is so soft and made of very good quality organic cotton. Wearing the brand’s clothes is like having Dorset (where it is from) at your doorstep. The whole collection looks fresh and fun. We love the sweet details and the whole inspiration behind the collection. Those clothes are great to go on some fabulous adventures in the country or at the beach. We love the bright colours, the super cute prints but most of all, the fact that all the garments we received are so soft. 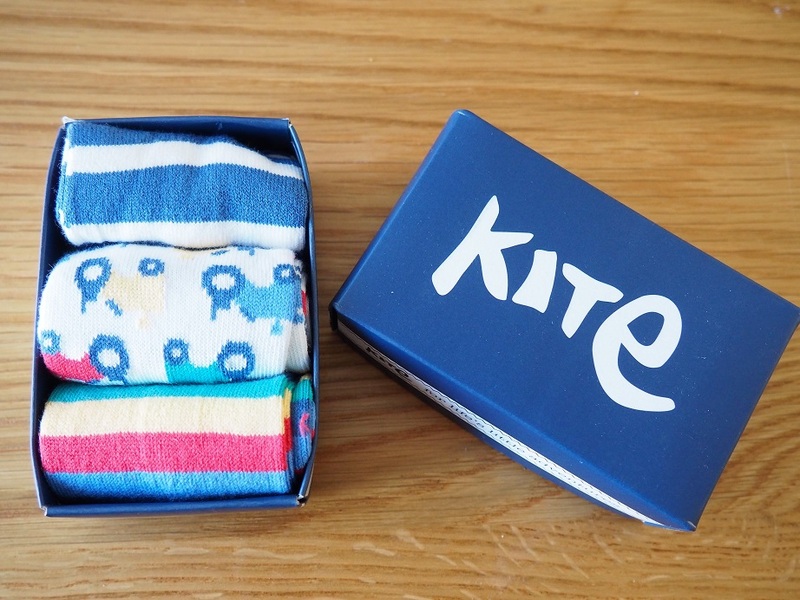 Kite is a fab brand that produces comfy clothes with beautiful fabrics! Do you fancy some clothes that fit for the coastline, countryside and everything in between? It’s your lucky day! We teamed up with this cool fashion brand and you are in to win a £50 voucher with Kite! Enter now via Gleam. Be quick, this giveaway is only live for a week! It is super short but it means you will be able to make the most of it and get some cute items in the sale! This giveaway starts on Friday 6th of July at 5 pm and ends at midnight on the 13th of July. Provision of the prize is the responsibility of Kite. Frenchie Mummy can’t be held responsible. Merci for reading Baba Fashionista with Kite and good luck with this super short giveaway! Disclosure: We received all the clothes featured in this post for free. All opinions are my own. Sitting outside enjoying the warmth of the sunshine. Playing on the beach and paddling in the sea! We live right beside the seaside! My grandaughter is very keen on slautering spiders at the moment with water sparys. nieces little ones love trips to the beach! Their favourite thing to do in the summer is go on holiday. The beach is the best part of that! Splashing about in a paddling pool. Splashing around a paddling pool. Swimming and playing in the garden. I don’t have any children but would love to win this prize to get some cute clothes to donate to charity, to go to Romania. Making mud pies in the garden at the minute and anywhere he can splash around in water . Would spend all day on the beach. play footy in the park! My 2 year old loves to play in our garden with his new water table! Blowing bubbles in the park is probably her favourite summer activity. Anything to do with water play, and above all a trip down the river in the boat to feed the Swans and Ducks. I really value Happy Meals, especially during the school holidays when costs are high. They are a sensible size, a sensible price, a sensible range of healthy options and the children love them. I don’t give the children meat but McDonalds are very good at leaving items out on request. Going to the beach with a bucket and spade! My grandson loves his paddling pool. My kids love going to our local splash park! My little boy loves playing in the water park and eating ice cream! My little one loves playing in the water park and eating ice cream! Everything to do with water especially paddling in the pool and water blaster fights. Paddling pool and water balloon fights ! We love going camping too ? At the moment it is mess around with water. Mine love paddling in the river Ouse and feeding the ducks, when they can get close enough. We have a brilliant park nearby that has a water area and my son has absolutely loved spending his time playing there! My toddler loves playing with sand. Visit the beach, build sandcastle, enjoy an ice cream, etc. We like to take the dogs to our local wood where we can explore and also feed the ducks (our dog is totally obvious to the ducks even though he’s a labrador) on the river and then use the picnic spot for a rest and a picnic. We play hide and seek in the garden. It is great fun – especially when I got stuck in the dog’s kennel! 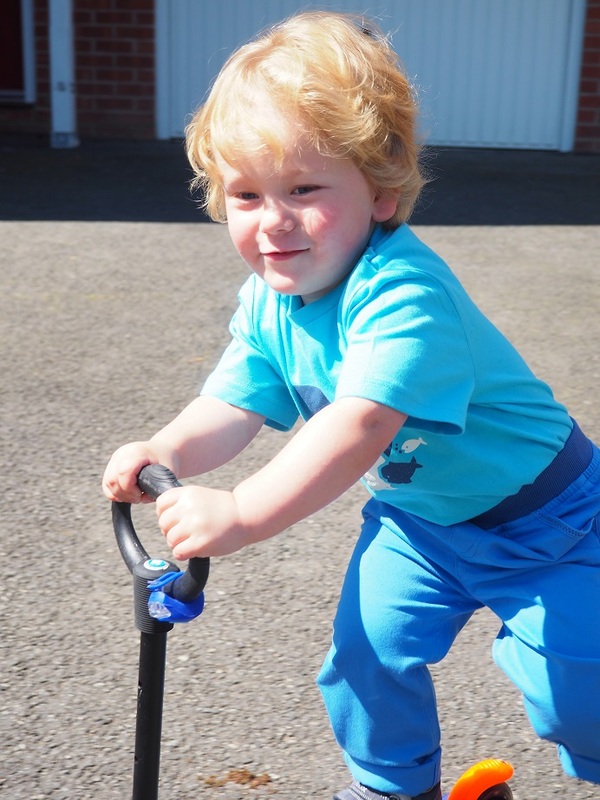 With the World Cup on the TV at the minute, my son loves playing footie in the garden! My son loves the beach, we go every summer since he was a baby. We like to have picnics down by the riverside. Vegetarian so I don’t like chicken wraps! My son loves to go swimming when the weather is hot. Splash around in the paddling pool or the sea! 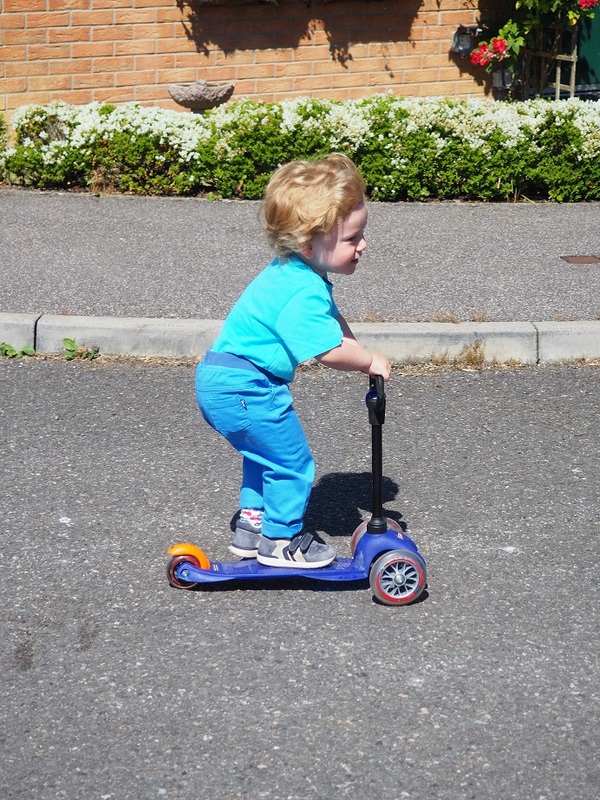 They like playing outside, water play, paddling pool and riding their scooters. My boys love playing football and jumping on their trampoline all summer long! My son just loves to be outdoors. His favourite is to spend time at the local splash park and then have ice cream! we are vegan so do not do maccys. absolute junk food that i really don’t think should be eaten by small children anyway.